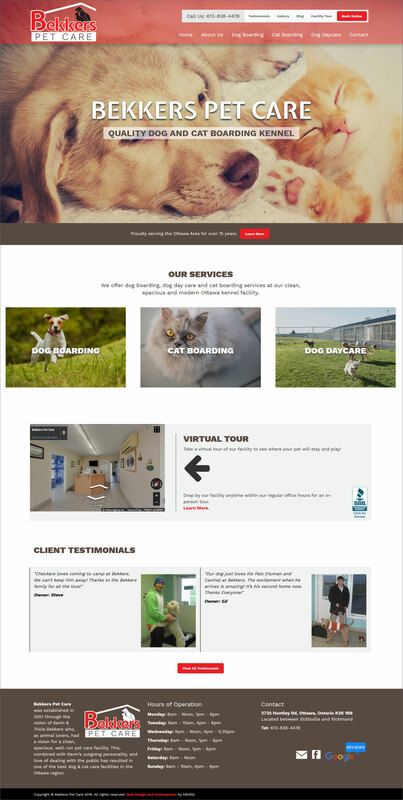 Quality dog and cat boarding kennel. Bekkers Pet Care pride themselves on being the best pet care, pet boarding and dog daycare facility in Ottawa. For over 15 years, they’ve built their reputation on honesty, quality of care, and employing great people. Although their facilities and staff are top notch, their marketing materials fell short of that mark. Bekkers Pet Care originally came to ABORG to help with reputation management, after some clients mistook them for a completely different kennel. Before long, they agreed to let ABORG help improve every aspect of their digital presence, and they never looked back!